This illuminated page was made in Flanders in about 1475. The writing is in a single 14-line column, the border on both sides is a firmly-defined rectangle latticed into triangles filled with cinnamon, deep sky blue, and gold which frame simple sprigs of flowers including thistle and violet. Whether this leaf was once part of a specimen set of Ege's Fifty Original Leaves from Medieval Manuscripts is not known, but it does retain evidence of mounting tape of the kind used by Ege. It was purchased in 2012 on Ebay using a speaking honorarium from the Aldus Society of Columbus, and is donated to the William Howard Doane Library at Denison University in the Society's honor. Denison is already the owner of an Ege manuscript leaf portfolio and so this leaf is now the second from its parent manuscript to be part of its Special Collections. The text on the leaft contains most of Psalm 24; it was part of the Hours of the Blessed Virgin intended to be read (in this particular case) upon first waking on a Sunday, Monday or Thursday. 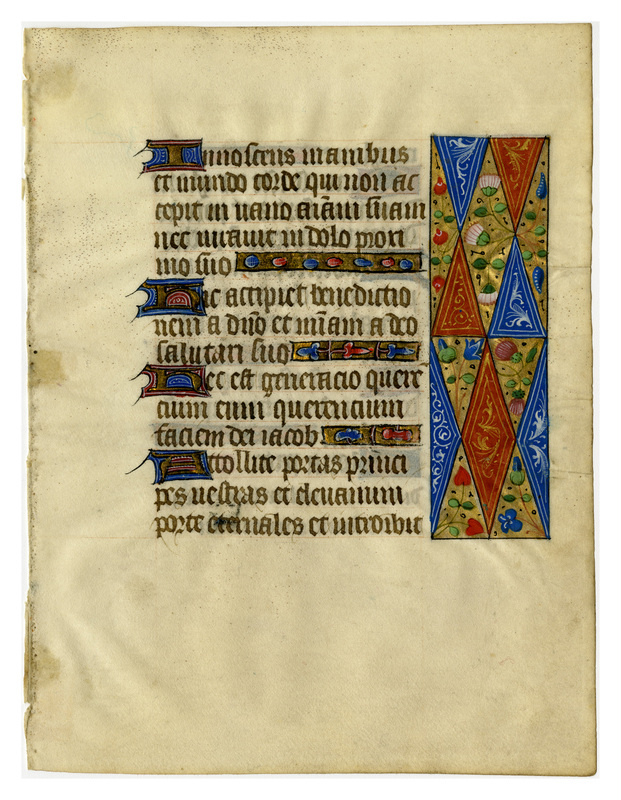 The verso side of the leaf ends with an antiphon indicated with red initial A. Donated to Denison University Archives and Special Collections by Dr. Fred Porcheddu-Engel.in March 2013. Item in public domain. Description by Dr. Fred Porcheddu-Engel. 300 dpi JPEG; 177 x 133 mm, written area 94x63 mm. Made of vellum. Recto Translation: Psalm 24:4-7 He that hath clean hands, and a pure heart; who hath not lifted up his soul unto vanity, nor sworn deceitfully. He shall receive the blessing from the Lord, and righteousness from the God of his salvation. THis is the generation of them that seek him, that seek thy face O Jacob. Lift up your heads, O ye gates; and be ye lift up, ye everylasting doors; and shall come in... Verso Translation: Psalm 24:7-10 ...the King of Glory. Who is this King of glory? The Lord strong and mighty, the Lord mighty in battle. Lift up your heads, O ye gates; even lift them up, ye everlasting doors; and the King of glory shall come in. Who is this King of glory? The Lord of hosts, he is the King of glory. GLory to the father. Antiphon: Blessed art thou among women, and blessed be the fruit of thy womb. Verso Transcription: rex glorie Quis est iste rex glorie dominus fortis et potens dominus potens in prelio Attollite portas princi pes vestras et elevamini porte eternales et introibit rex glorie Quis est iste rex glori dominus virtutum ipse est rex glorie Gloria patri. A. Bene dicta tu in mulieribus et bene dictus fructus ventris tui. 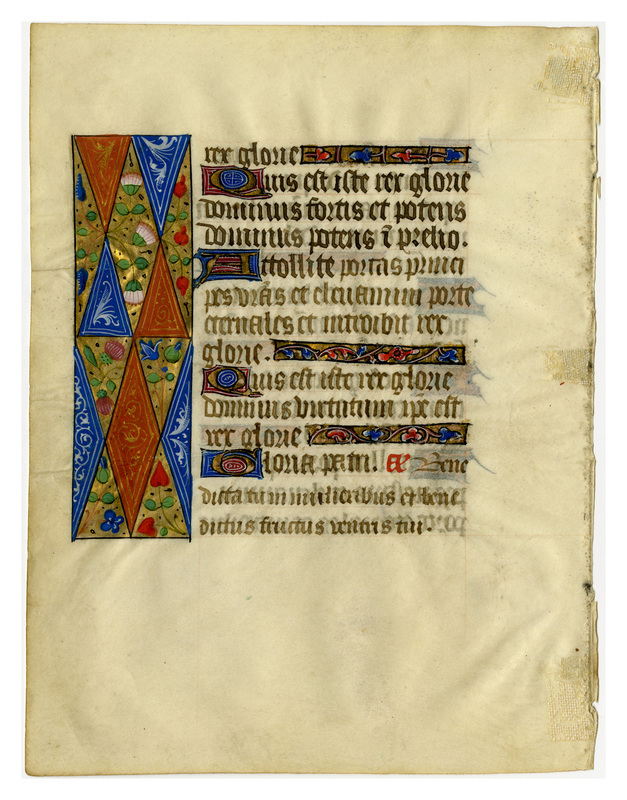 “E0109 Leaf from a Book of Hours,” Digital Exhibits | Denison University Archives & Special Collections, accessed April 23, 2019, http://exhibits.denisonarchives.org/items/show/72.